Description: Date is a guess. And I don't remember where I took this picture! 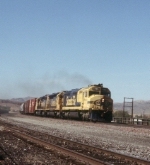 Description: Not the greatest pic in my collection, but you take your action views of ATSF cowl units leading as you find them, and maybe Bernie will like it anyway. ATSF 5965 leads a set of light helpers coming down off the mountain and heading back to Bakersfield. She was later Wisconsin Central 6654. Date of photo approximate.